You may be surprised to learn that relatives of your kitty cat were our prehistoric ancestors’ biggest predators. Many animals liked to dine on our forefathers millions of years ago, but none were as successful as the animals related to our pet tabbies. 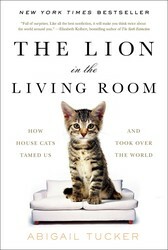 Read about our long shared history with our favorite pets in The Lion in the Living Room: How House Cats Tamed Us and Took Over the World. 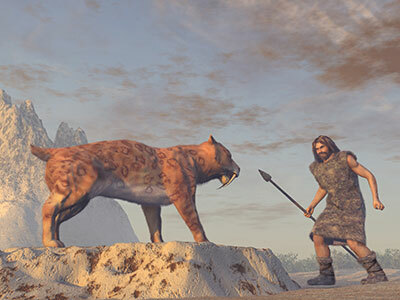 Humanity’s early ancestors came of age in Africa during the “heyday of cats,” according to anthropologist Robert Sussman, whose book, Man the Hunted, details our history as a prey animal. In regions where we “overlapped” with cats, he tells me, “they took advantage of us completely”— dragging us into caves, devouring us in trees, caching our eviscerated corpses in their lairs. Indeed, we might not know nearly so much about human evolution if not for big cat kills. The world’s oldest fully preserved skull representing the Homo genus, known as Skull Number 5, was recovered from caves in Dmanisi, Georgia, which likely served as a sort of picnicking ground for extinct giant cheetahs. In caves in South Africa, paleontologists endlessly puzzled over piles of hominid and other primate bones, trying to figure out the source of the carnage. Had our forefathers massacred each other? Then somebody noticed that the holes in some skulls lined up perfectly with leopard fangs.